S&S Mens I travelled to Norwich Dragons with several regulars missing and suffered only their second defeat of the campaign. Goals came from Danny Price and Tom Pateman in a 5-2 loss for the East Men’s League Division Two South leaders. Normal service will hopefully be resumed whenthey travel to Dereham next on February 27. S&S Mens II also lost this weekend, 3-1 at Stevenage III. With several regulars missing it was always going to be a difficult task to overcome a Stevenage side whose only other defeat of the season was at the hands of S&S. Despite a well worked early goal from Stevenage, S&S had most of the possession in the first half and right on the stroke of half time scored a deserved equaliser, Robbie Stevens hitting a dipper into the back board from a short corner. The second half was not a good one for S&S. Stevenage outplayed them with a tactically astute and simple brand of long ball hockey that caught the IIs out. 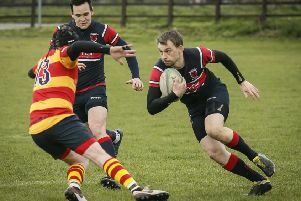 Two good finishes were enough to take the East Men’s League Division 6SW points, although S&S did have the chances to steal a point they probably did not merit on the day. The Mens IIIs continued their excellent campaign with a good 4-1 win over fellow promotion hopefuls Broxbourne IV. In a fairly even first half S&S’s superior finishing saw them go into the break 2-0 up, goals coming from Ryan Devlin and Steve Ashdown. The second half saw S&S mostly in the ascendancy and two more goals were scored this time by Jacob Foad and Joe Purslow. Broxbourne had the consolation of at least getting one in reply. A much changed S&S Mens IV went down 5-2 at Harpenden IV. It was of little surprise that a lively and skilful young Harpenden side caught S&S on the hop and within 12 minutes they were 3-0 down. However this year’s Mens IV are made of tougher stuff and the rest of the half was a lot more even. The second half started again poorly for S&S and they allowed Harpenden to play too freely and this well drilled young side took advantage to score two more goals. Finally S&S clicked and played their best hockey of the game as Harpenden tired. Lewis Bridger, in his first game back since December, weaved his way through the Harpenden defence and finished well. Elliot Wood and Ed De Luca produced some great runs and were unlucky not to add another goal. Father and son then combined as Trevor Bridger found Bridger junior from the short corner, his shot was stopped illegally by a foot, the latter then stepped up for the resultant flick and finished well. S&S perhaps could have scored another couple, but the revival was all too late and Harpenden ran out deserved victors despite a spirited second half display.